I used this post on making spool clamps as a guideline to making mine. I suggest reading that before reading mine. I was aiming to make my clamps to the specifications (diameter and opening) of StewMac’s, so I pulled out their catalog to see what the sizes are (they don’t list them online). The small clamps are 1″ in diameter with a 1-3/4″ opening, and the big ones are 1-1/4″ in diameter with a 5-1/2″ opening. I got a 4 or 5 foot long 1-1/4″ thick dowel rod from the hardware store near me, and ordered 40 8″ long 1/4″ diameter carriage bolts, 40 washers, and 40 wing nuts from Wholesale Bolts. I got the zinc plated ones, but I don’t think it matters really. By the way, I suggest measuring the dowel rod before buying it – at one store the 1-1/4″ dowel rods were actually 1″ rods. Like Ian Pender, I decided to cut the rod into 3/4″ thick pieces/pads, and I believe that’s how thick are the StewMac ones also. I foolishly (part of being new to woodworking) marked on the dowel where I’ll make each cut, and even accommodated for the thickness of the blade! That took about an hour to do (I had to make 160 markings!) and was super dumb because it’s just wasn’t going to work out: Once I started cutting with the miter saw, I realized that it’s very difficult to align the blade with the markings and my cuts came out in all kinds of thicknesses around 3/4″. Luckily, someone who was at the space where I have access to these tools suggested that I use the table saw for smoother and faster cuts. I then also improved on my method of cutting (or maybe that was also her suggestion?) and clamped a wood block to the sled 3/4″ away from the blade. I held the dowel against the block before each cut and passed it through the blade. Each piece came out exactly 3/4″ thick, and I didn’t have to spend 30 seconds aligning the blade to markings before each of the 80 cuts. Since some cuts were crappy, as a result of trying to align the blade and markings, I ended up buying another 1-1/4″ rod. This time it was from Home Depot, and I decided to go with a dowel whose diameter was a little wider than 1-1/4″, yet it wasn’t 1-1/2″ either. My thinking was that the thicker dowel would allow me to “catch” more surface when clamping, and I’m right to think that, but it was a big mistake. I’ll explain why in a minute. Next I glued the cork padding to the dowels, but not before spending some time debating how thick the cork should be. It seems like cork sheets come in 1/16″, 1/8″, or 1/4″ thicknesses; 1/4″ seemed quite thick (and wasn’t available locally) and 1/16″ too thin, so I went with 1/8″ which I found at Jo-Ann’s fabrics. Honestly, I don’t think it matters how thick is the cork. It’s really only there to provide protection to the surfaces being clamped, and a little bit of grip too, probably. For the gluing itself, I went against Ian Pender’s advice and used Titebond. Double-sided tape is too expensive, and the stickiness makes it difficult to cut the outline with scissors or a razor blade. The trick to not drying the cork is to not clamp the two pads together while the glue dries. What I did was smear a thin layer of glue on the dowel pad, then lay it on the cork sheet. Once all the pads were laid on the sheet, I put small books on top to make sure they stay in place while the glue drys. The glue didn’t penetrate the cork, so it’s still soft and squeeze-y. The cork excess was cut of with scissors. The real challenge with this whole project was figuring out how to drill a 1/4″ hole in the center of each pad. I wanted the holes to be dead-center, so any method that didn’t require a drill press was ruled out. But even so, how the hell do you clamp a round, 1-1/4″ wide piece to the press’s bed? This video shows how to make a little jig to hold the dowel in place while drilling. The jig also made aligning the 1/4″ bit with the center of the dowel quite easy. Here, however, is where I ran into the problem of having a slightly wider than 1-1/4″ dowel: it was too big to fit in the jig I made for the 1-1/4″ pads, and it was too small to be held in a 1-1/2″ jig. What I ended up doing was outline the dowel on a piece of wood, cut the center line (that is used to clamp the dowel), then cut out the circular area with a bandsaw. That is, I went in with the band saw’s blade through the center line, then turned it on and chipped away at the wood until I cleared out the circle. It wasn’t a perfect circle, but it was adequate enough to provide sufficient clamping. I wonder what’s a better way to cut an intermediate-sized hole, so if anyone reads this and happens to know how, let me know! Drilling the center holes in the pads was easy. I clamped each pad in the jig, cork facing up, and drilled away. I suggest drilling cork-side up, because the cork will most definitely tear when the bit exits the wood, if it is clamped the other way around. Here’s a picture of two of the forty clamps. 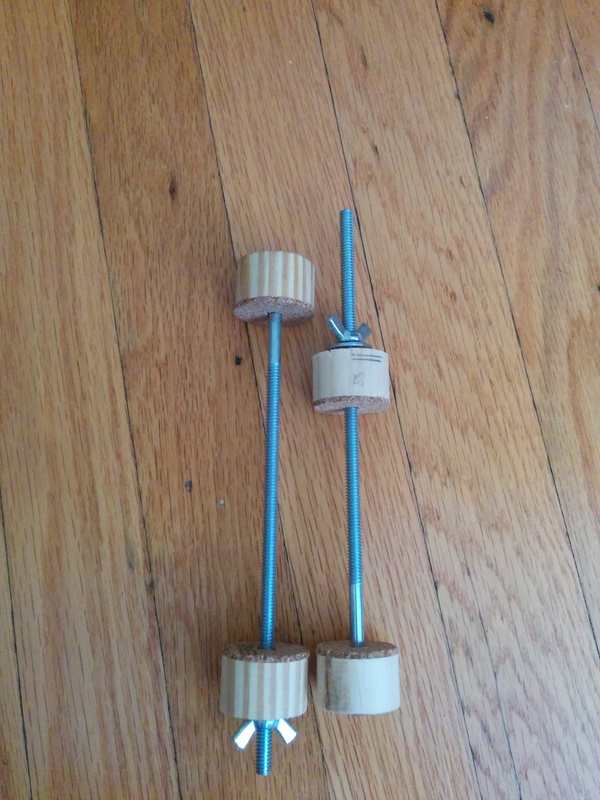 The one on the left is made from the bigger dowel; the one on the right is made from the 1-1/4″ dowel. You can see the pencil markings (dumb!) for the cuts on the right clamp.